Chair Entertainment has released a new update for Infinity Blade III. The iOS update is called Blade Masters and brings new maps, new enemies, new features, new items, and new goals and achievements to the game. Chair Entertainment also reduced the price of Infinity Blade III from $6.99 to $2.99 for a limited time. Check out the new trailer after the break. Meet the Collector, an ancient Deathless Blade Master who seeks to acquire the finest weapons ever crafted. Gripping his Solar Trans blade tight, RYTH RETURNS in his eternal quest to find worthy opponents to face him in the ultimate duel! New TRAINER feature! Enhance your skills and refine your technique battling with the Hideout’s new Training Bot. Introduction of Beginners Tournaments to allow newer players to compete against other new players with similar skill levels. New CUSTOMIZE feature! Added to the Character Menu is the all-new Customize screen, allowing you to change the COLOR of Siris and Isa’s armor, select a unique STYLE animation, view characters of your MYMOB friends, and even take a SELFIE! New GOAL CHASE feature! Compare your MyMob friends goal progress with chase tracking! Unlock ability to Master Items up to LVL 50! 6 new Enemies to battle! Over 25 new items for Isa and Siris, including magic rings, weapons, shields, helmets, and armors to collect, master, and sell. New Holiday Helms for Isa and Siris. Now translated into 2 additional languages: Latin American Spanish, Indonesian, and Thai. A number of additional balancing tweaks, bug fixes, and gameplay enhancements. Also includes content updates INFINITY BLADE III: Ausar Rising (Update 1.2), and INFINITY BLADE III: Soul Hunter (Update 1.1). 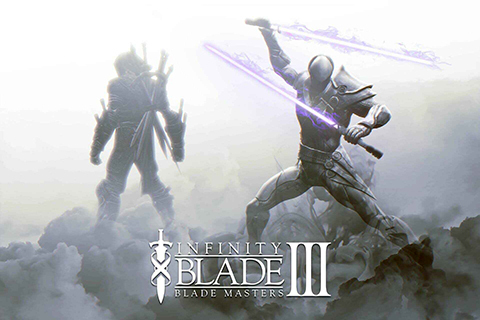 For a limited time only, you can download Blade Masters: Infinity Blade III in the App Store for just $2,99.